If you’ve lived in Atlanta for a while then you’ve most likely crossed one our trails. You may have even seen us out running, riding, parading around doing a bar crawl, or singing songs in bars. Who are we? We are the Atlanta Hash. While hashing wasn’t started in Atlanta, our fair city has been hashing since 1982 and has become one of the most active hashing communities in the world. Often described as “A drinking club with a running problem” hashing is an activity which combines exercising and drinking, sometimes at the same time. Each week a person (known as a “hare”) lays a trail in flour and/or toilet paper which is followed by the pack (known as “hounds”). The catch is that the hounds don’t know where the trail will end, nor what they will encounter along the way. All terrain is fair game. In my ten years of hashing I have hashed in all parts of Atlanta including its roads, railroad tracks, woods, streams, swamps, and sewer tunnels (all of which, with the exception of pavement, are known as “shiggy”). It’s the pack’s duty to find and follow the trail to its end, where they are rewarded with beer and “orange food”. Along the way the pack communicates by chanting “RU?” (are you on trail?) and “On-On” (yes, I am on trail) in order to complete their mission. 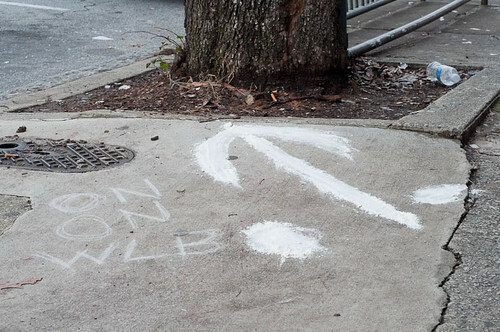 Atlanta’s hash trails range from three-to-six miles on average. One of the better things about hashing is that you actually don’t have to be able to run that far in order to participate. There is a motto in the hash that “Hashing is not a race” or as I like to say “There are no winners in the hash, we’re all a bunch of losers. Hashing is an activity with an accompanying community. Hash long enough with one group and you will be blessed with your very own hash name (mine is “Wee Little Bit” — don’t ask) by which you will be called for the remainder of your hashing days* In general hashers put aside color, race, religion, profession, looks, and politics; when it’s time to hash it’s all about finding trail and drinking beer. And if you do any of these trails then let them know that “Wee Little Bit” made you come. * unless you do something that warrants a renaming. paulie, i am so down for this once marathon training is over.